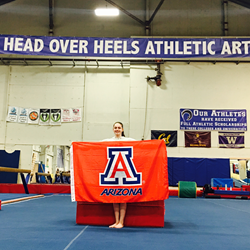 Level 10 Head Over Heels Athletic Arts’ gymnast Alessandra Brovedani -- who goes by Zaza -- announced her verbal commitment to the University of Arizona for the fall of 2019. After a handful of college visits, the Berkeley High School freshman announced her decision last month. Brovedani’s commitment to the GymCats came from her connection with the coaching staff and the excitement surrounding Wildcat Athletics. “What impressed me the most about the University of Arizona was the sports facilities, the number of fans, the weather, and the coaches,” Brovedani said. H.O.H. Executive Director and Girls Team Head Coach, Katreece Stone, agrees that the GymCat staff is a great fit for Brovedani. Brovedani, also a competitor on the rise, was just crowned the Region 1 All-Around Champion, punching her ticket to the 2016 Junior Olympic National Championships. In addition to winning the all-around title (38.25), Brovedani earned first on bars (9.625), second on vault (9.65) and beam (9.5), and fourth on floor (9.475). Leading up to the Region 1 Championships, Brovedani placed fourth all-around at the NorCal State Championships, with second place finishes on vault and bars and third place on beam. Brovedani’s sister, Talia, also a H.O.H. level 10 gymnast, made a verbal commitment to the University of Washington for the fall of 2017. Brovedani knew that she wanted to pave her own way and attend a different college than her sister. The Arizona GymCats finished their season ranked No. 21, with senior Lexi Mills advancing to the NCAA National Championships as a beam specialist. Brovedani is expected to make her to announcement official in the fall 2018 signing period. For now, Brovedani is focused on staying healthy and consistent for the Junior Olympic National Championships on May 6-8 in Fort Worth, TX. Brovedani enjoys seeing her former Head Over Heels teammates succeed in collegiate gymnastics and looks forward to contributing to a college team.